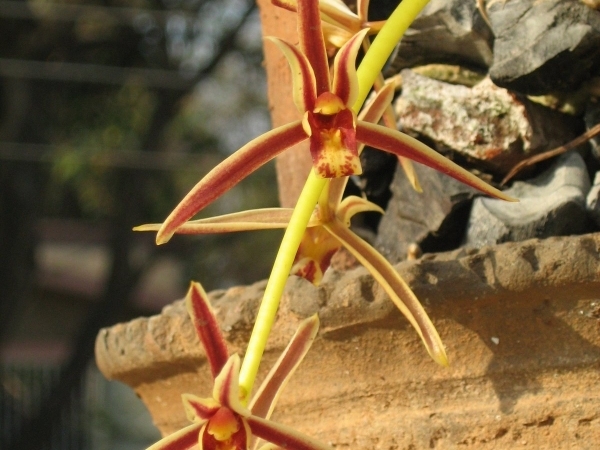 Orchid Cymbidium Bicolor is widely found in Western ghats and Himalayas. It is a tufted robust orchid with large false bulbs and pendulous flowers. They bloom during April to July. The flowers last for more than 20 days. This orchid is best planted in a coal, bark and moss mixture. 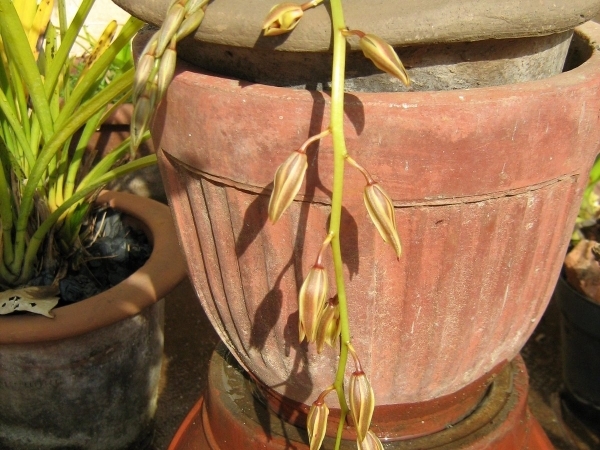 When the buds appear, it is better to keep the pot at an elevated level, as the long blooms of flowers hang well below the pot. Mist the orchid plants early in the morning and once in the evening during summers. 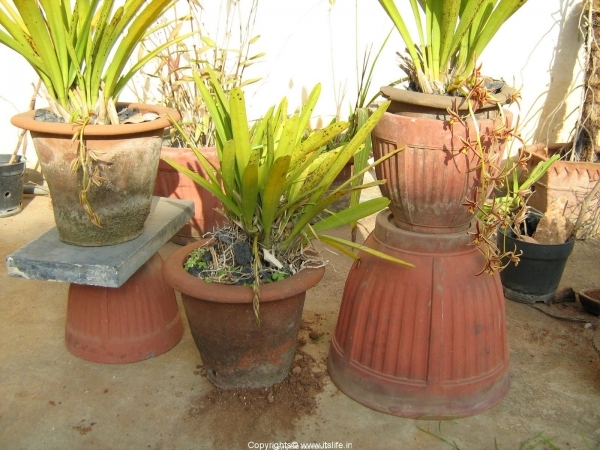 The plants need very less care during monsoon. Make sure that the water is drained completely else the bulbs may rot. these are some lovely pictures of Orchids that you have. I’m a newbie and ‘ve just got addicted to Orchids. I’m having difficulty finding resources for orchids in Bangalore. I was wondering if you would be able to help me out and share your experience and info with me. Thanks for the comments. 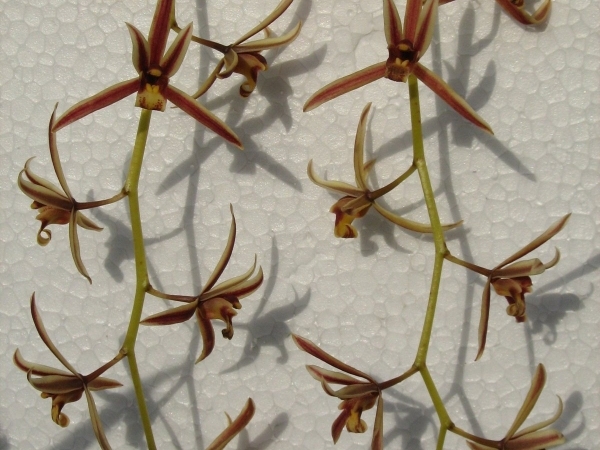 I have been collecting orchids from Srinagar in Uttaranchal and Western Ghats for the past 15 to 16 years. I also buy Orchids at Lal Bagh, Indo American Hybrid seeds nursery at Banashankari and stalls sets up in Lal Bagh during flower shows. Please feel free to write in queries regarding growing Orchids, I will try to answer to the best of my ability. Thanks for responding back. Can you please send an email to my personal mailid: satish@dacafe.com? I ‘ll ask more detailed questions to you, as I do not want to clutter up the blog space. Hi Shantha< wonderful and mind bogging!! I am also collecting orchinds for over 10 yrs.would like to know more about ordhids. 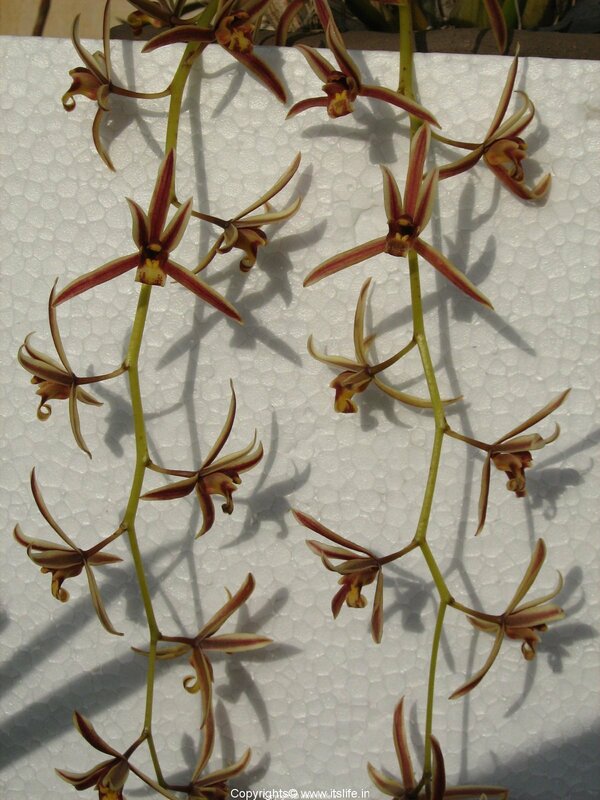 i have a few phalanopsis and denrobiums , cattelya etc. where are u put up? Hi Beena, Thanks for the comments and it is nice to meet someone who is passionate about growing orchids. I will share information regarding growing orchids in coming months in gardening section. Bark is not very essential in the potting medium. For the time being you can add coconut husk or pieces of coconut shell into the pot. The bark is not available for sale, I usually collect when I travel to hilly regions where the bark comes off just after the rains. Right here in Bangalore you can try to snip off pieces of bark from the street trees a day after it rains. HI Shantha , thanks for ur suggession, yes coconut shell is readily available. Btw 3 out of my 5 seedlings hav lost the bottom most leaf, which turnd yellow and came off, but I cud c sign of new roots emarging frm there. Now the the sedinglings r left with only 3 leaves, is it the reason that I have put them only in charcoal and brickpieces? Is there any way that I can send u snaps of my baby orchid so that u can c them and tell me how r they looking? Orchids are very hardy plants, they do not need much care. If there are new roots emerging it is a sign that the plant is alive. Do not bother too much about it. You can get some moss from any of the nurseries and stuff some in between the bricks to retain moisture. It is always better to buy mature plants than seedlings. For a beginner Dendrobiums are the best best! Awesome site. I am also into orchids (newbie) and would like to learn more about them. 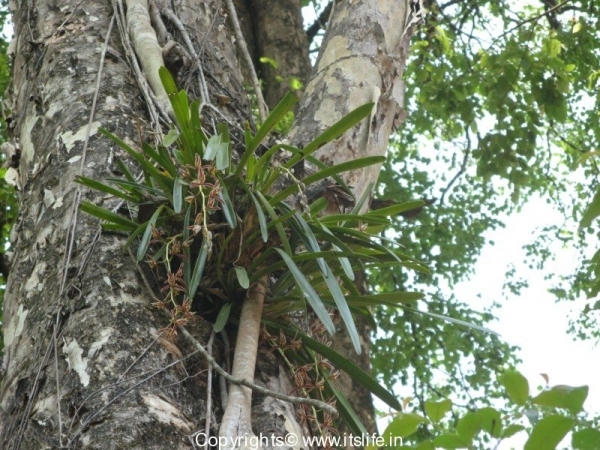 I was on a trip to Shimoga and picked up some wild orchids from the trees. Would like your help in identifying them and growing them too. Can you share ur contacts? Please mail me at my email. It is good to meet someone enthusiastic about growing orchids. You must have picked orchids from the Sagar-Theerthahalli belt. 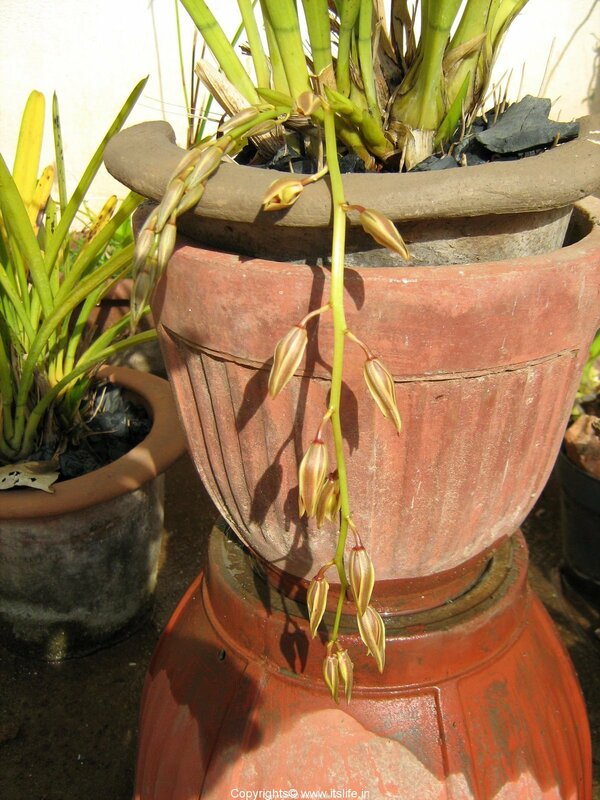 The wild orchids here are varieties belonging to Acampe, Dendrobium, Cymbidium, Bulbophylum etc., They are easy to grow but do not keep the pots under direct noon sunlight. You will have to wait till July – Sept 2010 for them to bloom. I will keep posting more about orchids for your reference. I have been collecting orchids for almost a decade and a half. My interest is wild orchids and as I wander around Western ghats, my eyes are always searching for orchids…not that I can pick them up easily…but I love to see them in the wild. Keep your eyes open when you travel in Western ghats the next time. The hybrid orchids are available for sale at Indo American nursery on K.R.Road. Thanks, Shantha. Can you refer anyone @ Indam whom I could speak with? Murali, I don’t know anyone personally there, but there are many gardeners working there who have considerable knowledge about orchids. They also have pamphlets on orchid cultivation. i am ankit and want to grow orchid in gujrat in junagadh district in the protected area i.e green house and normally the climatic conditon over here is humid and the temperature is around 20-37 degree celcious. so please suggest me which type of variety should i grow? and in how many monthes it will start flowering if i will use vegetative propogation. Great to know you are enthusiastic about growing Orchid. If the weather is something like in Mt. Abu growing orchids would not be a problem. Please contact a horticulturist in your region and get more information on how to grow orchids in your region. I was delighted to stumble onto this web site. 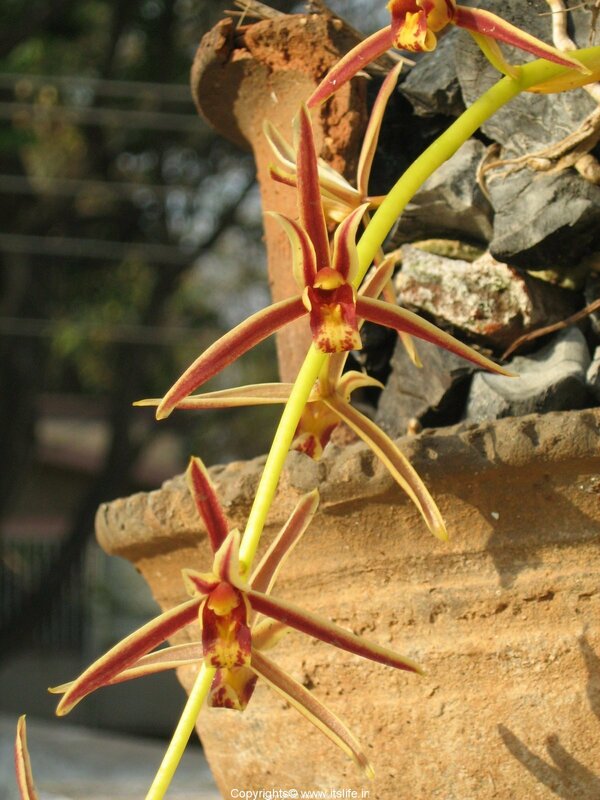 It is nice to have someone with more than a decade of experience with orchid cultivation based in Bangalore. I am a newbee bitten by the orchid bug. I just had a question about dendrobiums. I picked up some dendrobiums from thailand recently and noticed that they are planted in coconut shells. the coconut medium has rotted and the roots are deeply embedded in the very wet coconut shells. what can i do to save the plant? Thank you for visiting and leaving this note. Remove the plant from the shell carefully (it is acceptable if few fibers are sticking onto the roots) and plant it in a medium with Coal, Moss and pieces of bark. While growing Orchids always ensure that the potting medium allows complete drainage of water. Hope this helps. Thanks for your prompt advice. I tried out what you said except used coal, coconut husk chips and brick pieces as i don’t have bark. The roots were winding their way deep into the big (6inch) coconut husk and the roots were white and squishy. I might have lost some roots. Hoping the plant will recover. Summer in Chennai might be a bit too much for the orchids. Please mist early in the morning and late in the evening everyday without fail. Dilute the fertilizer and mist on leaves and roots once a week. Leave the stem as is for now and continue to water and mist. If the stem does not rot, then there is a chance of it forming new roots. i am from chennai and its raining season now. Usually plants rest during winter and do not grow much. Even though it is raining in Chennai, do not fertilize in winter. You will have to wait till June – August to bloom and sometimes it will be few years for them to bloom. Could you share your email and contact number. Would like to talk to you on orchids. Am glad to have bumped into you. You are resourceful.any other place other than Indo American I can buy Orchids?? Thanks for visiting. You can also try at Lal Bagh, though I recommend Indo American for Orchids.